For a trip across town or across America...you'll want Road Trip Survival Kit in your glove compartment. 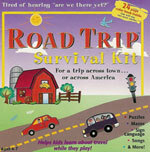 Make traveling with the kids entertaining and educational as they learn while they play with Road Trip Survival Kit. This 24 page colorfully illustrated book and audio cassette entertains parents and kids for hours as they sing songs, hear stories, learn sign language, play games, read maps and search for road signs. Don't leave home without it.